Over the first weekend in December, 2011, CORBA trail crew volunteers came out to help restore the fire-damaged trails of the Angeles National Forest. On a cool and mostly clear Saturday, CORBA and Mount Wilson Bicycling Association volunteers teamed up to work on the Gabrielino trail. The Gabrielino between Switzers and Redbox was opened to the public back in May 2011, though the trail has had little attention and was in very poor shapte. Through many sections the old trail is simply non-existent. Starting at Switzer’s Day Use area, the volunteers worked their way up the trail. At the outset, two large trees were removed from the trail. These had toppled in the ferocious wind storm of November 30, 2011, and were not present when the trail was surveyed for work a week earlier. A third tree remains and is too massive to move with hand tools. The yellow warning signs greeting trail users on trails that pass through burn zones has a clear message: That trees, weakened by the fire, pose a considerable hazard and may fall at any time. Especially now, more than two years after Station Fire, dead trees are beginning to rot and weaken. Falling trees will continue to be a danger for years to come. 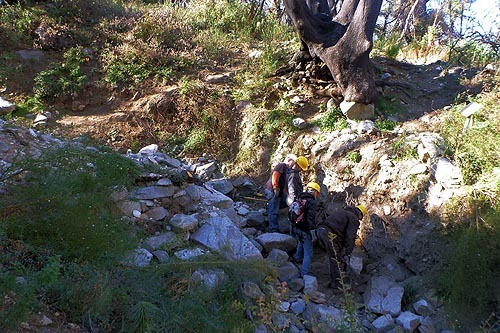 The volunteer trail crews, led by Mitch Marich of the MWBA, and Hans Kiefer and Steve Messer from CORBA, rebuilt two severely damaged drainages that required extensive rock retaining walls and rock armoring. In addition, tread was outsloped and widened along many narrowed sections and the brush was cut back. 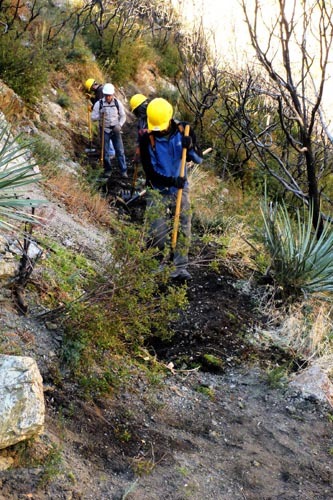 The crews worked on approximately 1.3 miles of trail, from switzers to the second stream crossing and switchbacks. 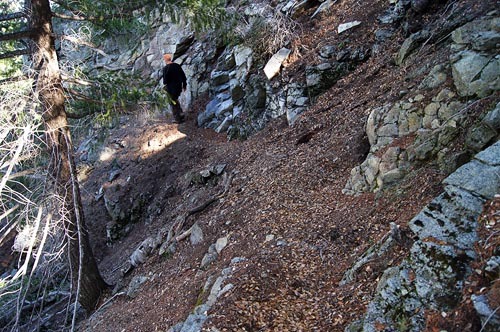 Some sections of the trail now run along the alluvial wash at the base of the canyon. This was created by the tremendous water and debris flows of the past two winters. 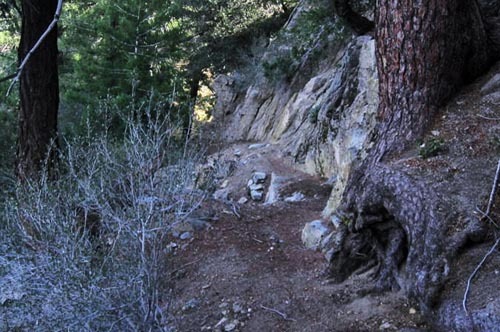 However, all of the trail worked on by the crew is now easily negotiable for trail users (with the exception of the one large downed tree that remains). 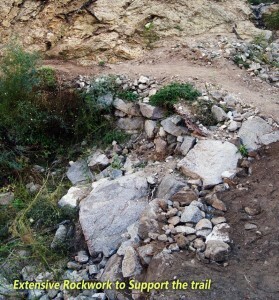 With another day’s work in January, we hope to have the entire trail clear of significant obstacles and seeing regular use once again. The crew was fed with pizza and sodas after the day’s work was done. Everyone came away from the event with a sense of satisfaction and were looking forward to getting the remain sections of trail completed in the new year. 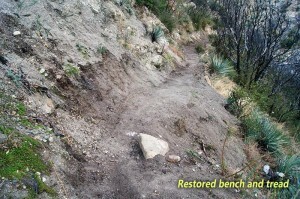 In response to a thread started on a popular local online mountain biking forum, SoCalTrailriders.org, CORBA volunteer Steve Messer agreed to facilitate work on this much-neglected trail. Starting from the summit of Mt. Wilson, the trail is the least-used of all the routes from the famous mountain. Over the years the trail tread had degraded and filled in with slough from the extremely steep and constantly sliding hillsides above. It was layered with two years worth of acorns and oak leaves, leaving the trail narrow, slippery and treacherous. It had suffered from a lack of use as well, with many sections of brush difficult to travel. An eager crew of 9 was able to re-cut the bench and cut back brush on 1.6 miles of the trail. The Forest Service did not want volunteers to work on two particularly dangerous landslide zones (one is pictured below), and CORBA has made arrangements for a professional trail crew to take care of those sections. About half the trail is now in good shape. Good shape, for off-road cyclists however, is a relative term. This trail has several dangerous sections through which cyclists should walk their bikes. Special thanks to all the volunteers who came out to help on the two days of trailwork: Mitch and the MWBA, Hans Keifer for coming out of “retirement” to lead the rock wall construction effort, Mike and Robin McGuire for the pizza and photos, and Mitch for additional photos. 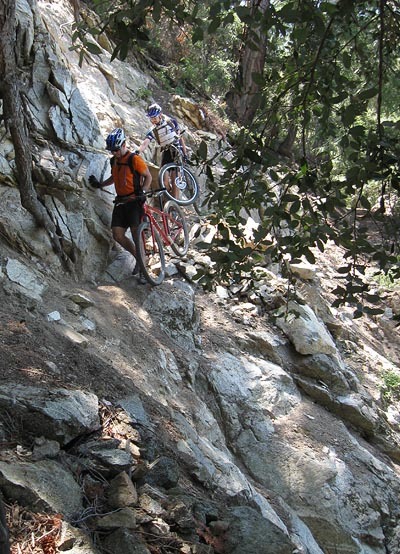 Over this productive weekend, mountain biking volunteers put in 159 person-hours into the Gabrielino and Rim trails of the Angeles National Forest. Watch for upcoming dates in January (weather and snow permitting) to continue work on Rim Trail and/or the Gabrielino trail. 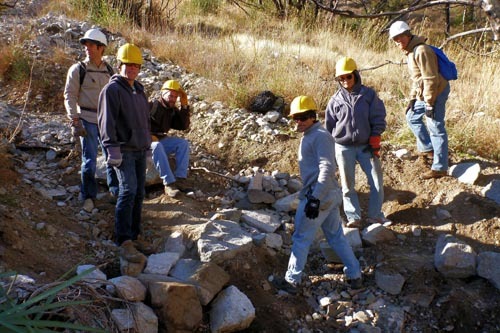 If you’d like to be notified of upcoming trailwork opportunities, send an email to trailcrew@corbamtb.com, or visit the Mount Wilson Bicycling Association’s web site. This entry was posted on Saturday, December 17th, 2011 at 10:57 pm and is filed under Angeles National Forest, San Gabriel Mountains, Trail Crew. You can follow any responses to this entry through the RSS 2.0 feed. You can leave a response, or trackback from your own site.